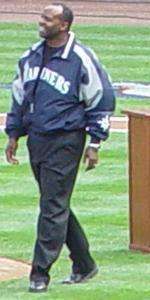 Alvin Davis at the Seattle Mariners Opening Day 2007. Alvin Glenn Davis (born September 9, 1960 in Riverside, California), nicknamed "Mr. Mariner", is a former Major League Baseball first baseman and designated hitter. Davis played his career primarily for the Seattle Mariners. He won the American League Rookie of the Year Award in 1984. During a 9-year baseball career, he batted .280 with 160 home runs and 683 Runs batted in. He hit 20-plus homers in three seasons, and drove in over 100 runs twice. Davis holds the Mariners record for the most consecutive games reaching base to start a career, with 47. Davis, who batted left-handed and threw right-handed, played college baseball at Arizona State. He broke into the majors with the Mariners in 1984 and remained there until 1992. Well liked by Mariners fans, Davis held most of the franchise's offensive team records until the arrival of Ken Griffey, Jr., Edgar Martínez and Alex Rodriguez. He burst onto the major league scene in 1984, homering in his first two big-league games and collecting three doubles in his third. Davis reached base in each of the first 47 games of his career, and was chosen for his only All-Star Game as a rookie. Named the Mariners MVP, he was also voted the American League's Rookie of the Year Award after batting .284 with 27 home runs and 116 RBIs. He was inducted into the Seattle Mariners Hall of Fame in 1997. After eight years in Seattle, Davis signed as a free agent with the California Angels. Released by the Angels in June 1992, he joined the Kintetsu Buffaloes in Japan. Davis only appeared in 40 games there, hitting 5 home runs with 12 RBI. Davis lives in Riverside with his wife Kim. They have 3 children. They are actively involved in Awana. Davis is also active in Cornerstone Fellowship Bible Church and coached baseball at Martin Luther King High School (Riverside, California) for ten years. In 2012, Davis returned to the Seattle Mariners as a roving minor league instructor. ↑ "Safe to say, Almonte makes strong first impression". MLB.com. 2013-09-24. Retrieved 2015-05-26. ↑ "Mariners Hall of Fame". MLB.com. Retrieved 2008-08-10. ↑ "Running Home to the Father". ↑ "Hisashi Iwakuma returns to Japan for personal reasons, but Mariners expect him to make next start".